​Which is worse: to believe in a false prophet or Shirk in worship? If a person who makes Musaylimah Al-Kaththaab (the false prophet) a partner in prophethood (together with the Prophet, may peace and blessings be upon him) is a disbeliever; then how can a person who makes a created being a partner in the worship of the Creator, Glorified is He, and sets him up as a rival to Allah, seeks deliverance from him the same way that he seeks deliverance from Allah, invokes him alongside Allah, hopes in him, seeks refuge with him in all of his affairs, offers sacrifices for him and makes vows for him... not be a disbeliever!?! 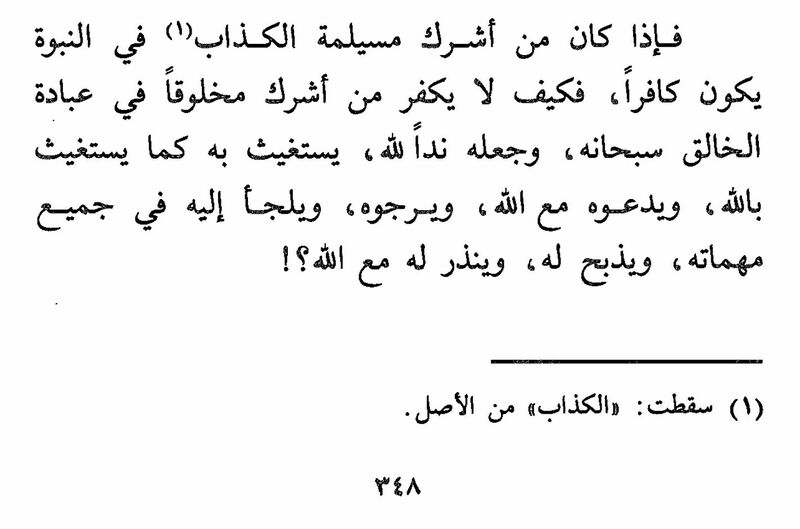 ​Source: Ad-diya' ash-shariq fi radd shubuhat al-madhiq al-mariq, page 348 [Click here for screenshot of page in PDF format].